ACCORDING TO NED BECK, director of marketing for KB Home, Charleston Park is in an optimum location. 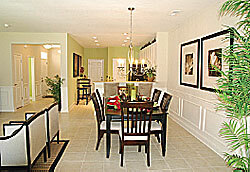 Great location aside, the town homes at The Pines at Charleston Park have much to offer. With six floor plans to choose from and the many options offered through the KB Home Studio, it is easy to customize these homes. The two-story town homes range in size from 1,267 square feet to a spacious 1,933 square feet and include two to four bedrooms and up to two-and-a-half baths. An extra feature not often found in town home construction in the area is the two-car garage. Although Charleston Park is located just off busy Dorchester Road, above Ashley Phosphate Road, it sits in a secluded spot. Care has been taken to place the homes near wetland and wooded areas. It will be part of a greater master-planned community, with walking trails throughout the property. In addition to The Pines at Charleston Park, a neighborhood of single-family homes, The Preserve at Charleston Park, is in the planning stages. The KB Home Studio is on Rivers Avenue, and this is where the creativity takes place. With literally thousands of choices, it is the best way to express your personality and surround yourself with the features and products you like best. Brand name appliances, flooring, lighting, counter tops and other options mean that your home looks like no other. Personal design consultants are on hand to help with decisions.